The Mayor of London's plans to build an airport in the Thames Estuary dubbed Boris Island have often been described as 'pie in the sky'. 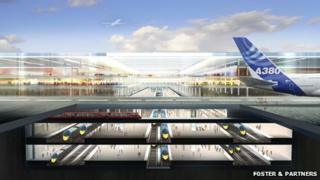 But now ambitious new plans for an airport in the Thames Estuary have been unveiled by the world renowned architect Lord Foster. Norman Foster is one of the most influential modern architects and is the man who designed the dome on the Reichstag building in Berlin as well as the terminal building at Stansted Airport. But the project he's most famous for extended the concept pioneered at Stansted to Hong Kong. Chek Lap Kok is one of the world's largest airports and this was among the most ambitious construction projects of modern times. Lord Foster now wants to take that expertise to build an Estuary Airport on the Hoo Peninsula. He says it would have four runways and would be capable of handling 150m passengers a year. The location has been chosen because it is 55km from London and can be reached in 30 minutes by high-speed rail. But it wouldn't just be an airport - the ambitious plans for a Thames Hub would bring together rail, freight logistics, aviation, energy and its transmission, flood protection as well as regional development. Lord Foster says it's necessary because the UK is facing 21st Century challenges including an over congested rail network and housing shortages particularly in London and the South East. In addition the UK's only hub airport - Heathrow - is already operating at capacity with no room for expansion. Those problems - he says - can't be tackled with short term patching up of the existing ageing infrastructure. He says his plans will deliver lasting social, environmental and economic benefits and improve the lives of the 5m people who live under the flight path at Heathrow. But what of the residents in Kent? There's been fierce opposition from MPs, local councillors from Medway and Kent County Councils as well as residents. A similar plan by London Mayor Boris Johnson for an airport in the Thames Estuary, known as 'Boris Island', was ruled out as an option by Prime Minister David Cameron last year. And an airport at Cliffe in Kent was also considered but was rejected by the Labour government in 2003. Campaigners say the site, which is renowned for its populations of wintering birds and is an important breeding ground for birds such as avocets and marsh harriers in summer, must be protected. But now the new Transport Secretary Justine Greening has refused to rule out the possibility of building an airport in the Thames Estuary. Speaking at a conference of airport operators Ms Greening, who was appointed last month, said all the options for increasing airport capacity in the South East would have to be considered - including a new airport offshore between Kent and Essex. So, it seems the plans, despite being dismissed by opponents could, if Lord Foster gets his way, yet fly.